FAYETTEVILLE, N.C. – It’s never easy when it comes to a series between the Marksmen and Ice Bears, and this weekend once again proved that – for both teams. Friday night in Knoxville proved, on multiple occasions, why no lead is safe. Knoxville lead after the first period, but the rest of the game, Fayetteville was battling to maintain two-goal leads, ultimately winning 5-3 thanks to a very rare empty-net goal. Saturday night was a nasty cocktail of everything going wrong for the Marksmen, as the Ice Bears dominated in nearly every facet, coming away with an 8-2 victory; Fayetteville’s biggest loss of the season. The Marksmen did however win in the jersey department, skating out in one of the most-striking sweaters of the 2018-2019 SPHL season. Due to the weekend-split, there was no movement in the standings for these two neck-and-neck opponents, meaning the coming weekend’s series could be the one to decide who jumps who. With a hard-fought weekend battle, there were noticeable efforts in the home-and-home. Here are our Three Stars of Week 16. When you need a solid blue-line, back-skating defensemen, Paul Fregeau is exactly what you’d be looking for. He’s your ready-to-skate stay-at-home defensemen, and because of that, will not have the highest numbers in the points department and will not be your common shots on net guy. That’s why when it comes to him scoring a goal in a tight game, it’s hard not to put him in the Three Stars discussion. In Friday night’s game, Fregeau skated the puck along the blue line, moved up above the left circle, and shot it on net, finding its way through to give an insurmountable lead for the Marksmen. 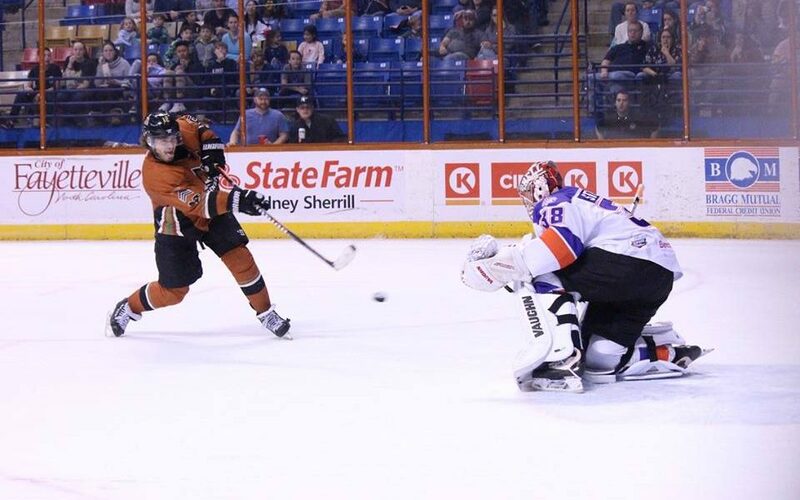 This goal was Paul Fregeau’s FIRST SPHL goal, and his second professional goal (Watertown FHL, 2018). Hard not to be excited for a guy who works as hard as Fregeau to finally get a big one in the G column. Taylor McCloy has been a consistently solid play-making forward since coming over via trade from Quad City. On multiple occasions, McCloy has been spark plug for goal-scoring, especially during the course of the Marksmen eight-game winning-streak. The only thing that the Adrian College grad was missing from his time with the Marksmen, was his own mark in the goal column. He’s gotten close, but he’s made some selfless and timely decisions to pass off shots to turn them into set-up passes. This weekend, McCloy finally had his chance to score. In the waning minutes of period three on Friday night, Fayetteville was looking for an insurance goal in a tight 3-2 game. Somehow, McCloy snuck behind the Knoxville defense, got a perfect lead pass, and dangled away from a risk-taking goaltender to put what would become the game-winning goal (McCloy’s first career!) in a 5-3 victory. While not having the flashiest statistics, McCloy’s work-ethic and ability are more than obvious when watching him move the puck. Don’t expect this goal to be his last for some time. Bowen had another pair of goals this weekend, and ended up having over a point-a-game weekend as he found himself an assist as well. He started off the scoring for the Marksmen on Friday night, and had the last goal of the weekend for the team as well. Brian Bowen finished the month of January with 14 points (6G+8A) in nine games, and already looks to be well on his way to another hot month heading toward the playoffs. Now with Captain Jake Hauswirth returning to the regular lineup following personal leave and illness, expect the entirety of the leadership line to see major point boosts in the month of February. Bowen is making a name for himself not just among rookies, but among goal-scorers in the SPHL. You can only imagine what and where he’d be if he started the season in Fayetteville. Another pressure-cooker series against Knoxville this weekend, another weekend of expectations on the stick of #12.